You are under 55 years of age. Includes ball, putter & 1 round of 18 holes. You are 55 years of age or more. Includes ball, putter & 1 round of 18 holes. I.D. required. Glow Putt Mini Golf is an indoor, glow-in-the-dark, miniature golf course. 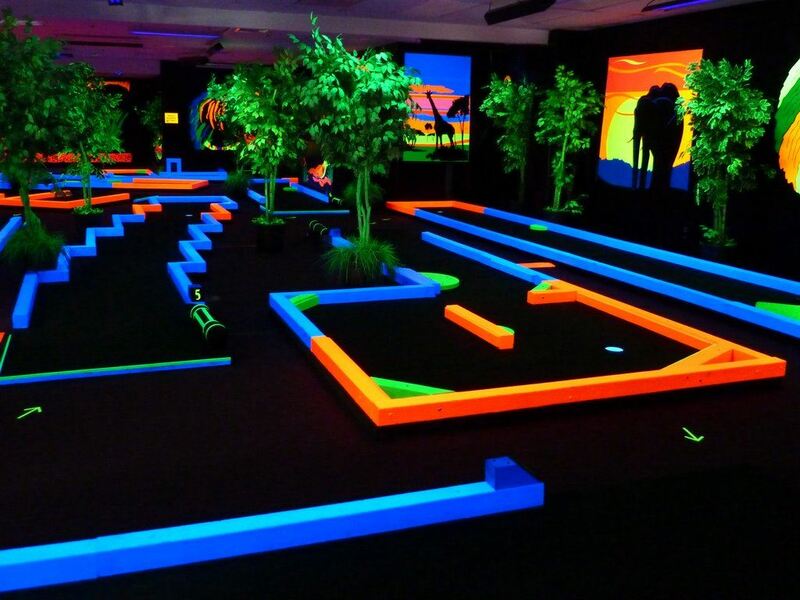 The jungle-safari theme surrounds a challenging 18-hole course that is illuminated with special UV lighting. Even the golf ball is special as it glows brilliantly each time it passes through one of the many custom-made CHARGERS located throughout the course. The layout is designed to challenge and please all skill levels as you make your way through the air-conditioned course. Balls & putter are supplied and they sell water & soft drinks. Be sure to wear something that GLOWS. After our 18 holes, join us next door for Lunch at Jade Palace and then some dessert at Sweet Republic.